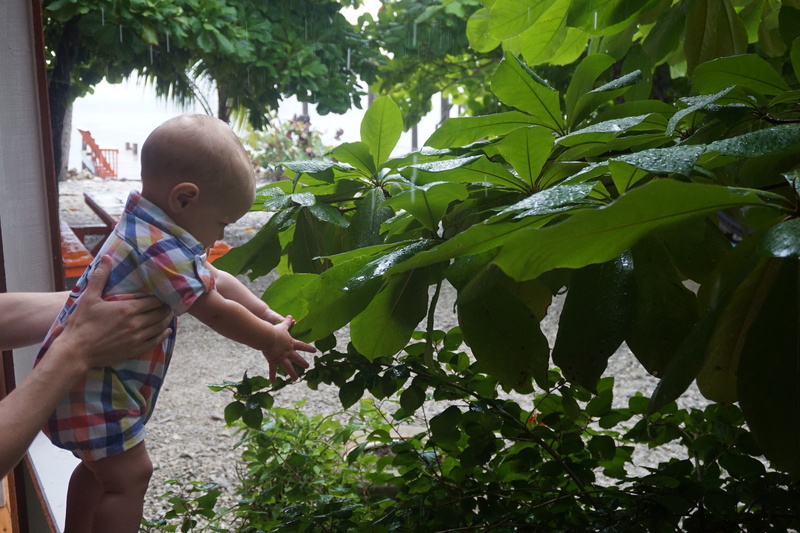 It has been raining the last few days on Utila but you have been enjoying it all the same. The rain only seems to come at night or the early morning and the skies are clear by 9am. But with the rain comes respite from the intense Caribbean heat. You have not been sweating as much and you are sleeping soundly eleven hours a night. You are definitely a water baby; loving the lake at the camp, the ocean, bath time and now your new favorite, shower time. Today you loved feeling the rain drip on your head and face. You reached with excitement for the full drops bouncing off the broad leaves. It was nice this morning to Skype with your grandparents back home who are missing you dearly. 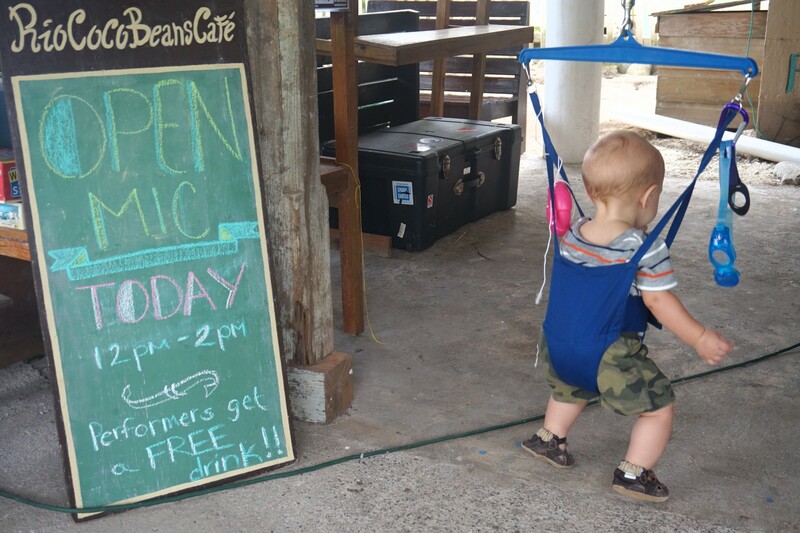 A few days ago we noticed a sign advertising an open mic day at Rio Coco Cafe, just a few blocks from our hostel, so we rounded up the Israelis and with the jolly jumper in tow, we thought we would give it a try. 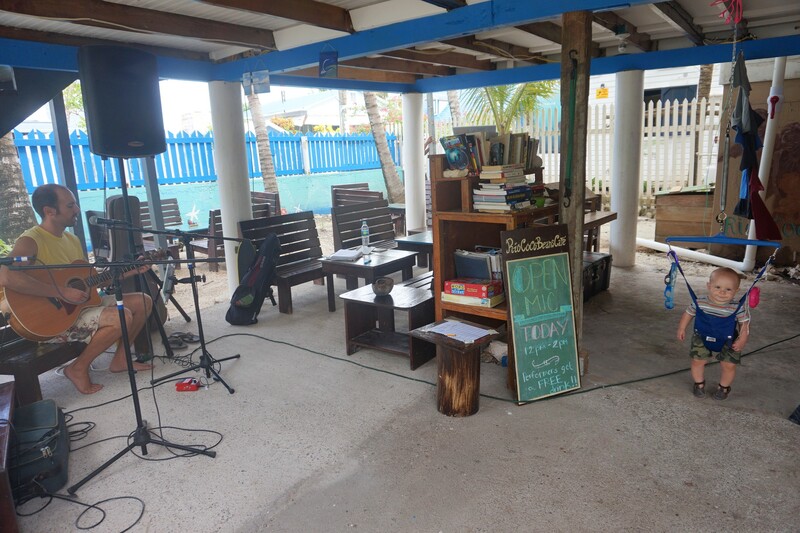 Rio Coco Cafe is a not-for-profit business that not only sells fair trade beverages but any profits are donated to build schools on the Miskito Coast of Honduras and Nicaragua. The Miskito people are indigenous to Central America, calling the western coast home long before the arrival of the Spanish and British colonialists. There is also a blend of people of African descent who either escaped slavery or were shipwrecked and washed up on the western coast of Honduras and Nicaragua. Access to basic rights like clean water and education is a growing concern in the Miskito region. 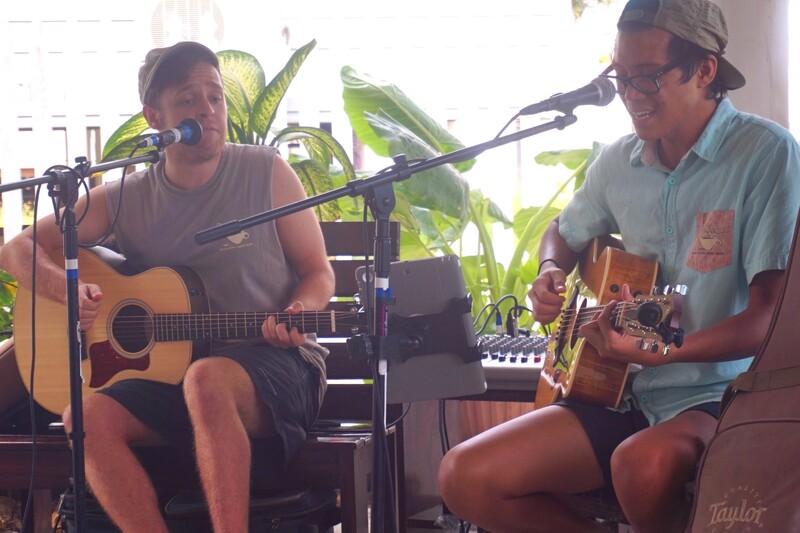 Rio Coco Cafe, staffed by friendly and talented volunteers Josiah, Camden and Nick, has built a dozen schools and continues to support the Miskito. We arrived to Josiah strumming mellow riffs and crooning love songs with a sound similar to Dallas Green or Brett Dennen. Nick joined in on guitar and layered in some tight harmonies. There were not too many musicians who showed up so your mom and I took the stage next. The patrons enjoyed watching you groove in your jolly jumper while your parents tried out some classics. Andrey, one of the Israelis from our hostel has a gifted eye and snapped photos to capture the moment. You were mesmerized by all of the music and loved when your familiar tunes were played. 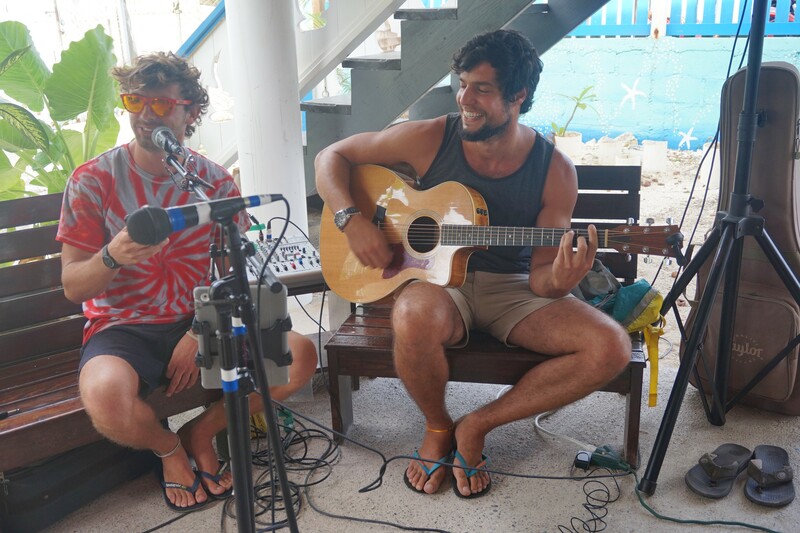 Next, Ofir finger picked a ballad while Andrey reached some soulful falsetto. 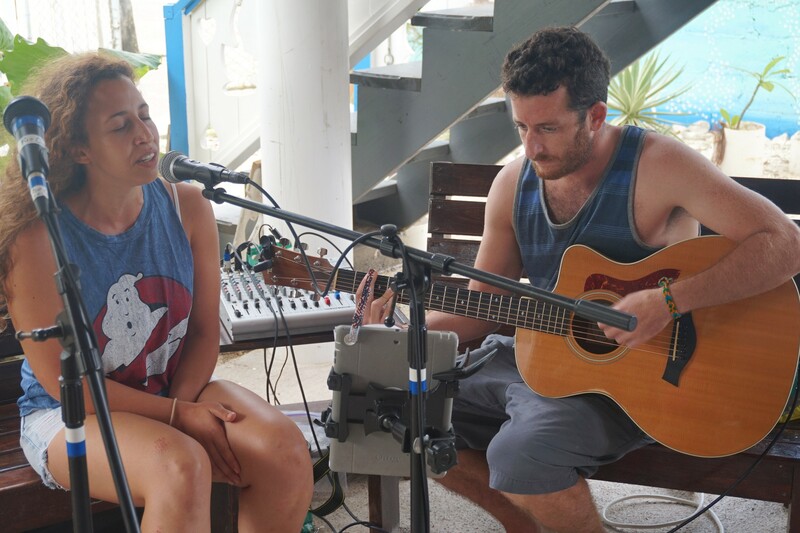 Another Israeli couple from our hostel, flipped the guitar upside down and performed while Ofir translated the Hebrew into English. Performers received free drinks so we could not resist trying the chocolate peanut butter smoothie. They even poured a little cup for you and you smiled with each sip. As we walked back to our hostel, we talked about how important it is to be more aware of what business we are supporting on the road and back home. 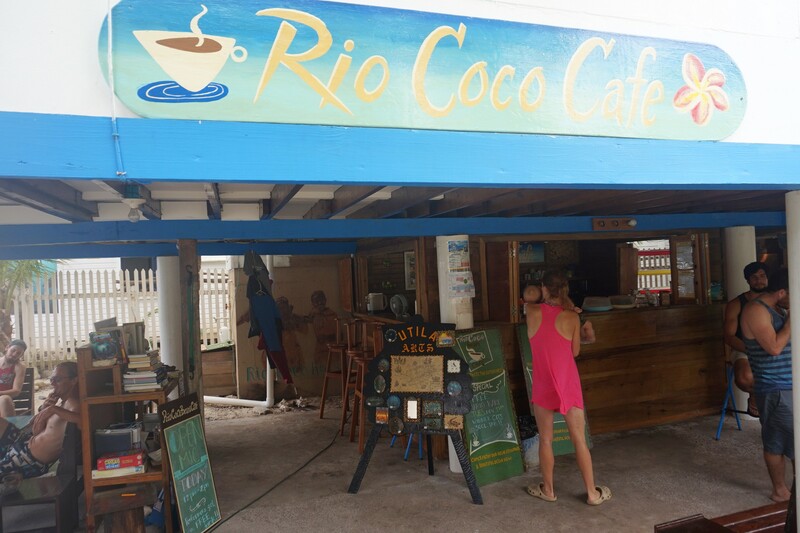 It is unanimous on the island that Rio Coco Cafe serves up the best coffee, lattes, tea and smoothies and they are doing it without profit as the motive. It is often argued that profit is the motive for innovation and “progress” but I bet if the innovators of the world were surveyed, passion and creative problem solving would be the driving force for their success. In 2015, the year of your birth, the average of the top 100 CEOs in Canada earned 190 times more than the average Canadian. That means it would take an average Canadian 190 days to earn what a CEO earns in one day. Surely there is a more just way to distribute profits. Asher, it seems like your development curve is rising more quickly. Today you pushed yourself up into the sitting position on your own, you now say “mamama, bababa and yayaya”, you began to make a kissing sound with your lips, and when there is an aid in front, you can pull yourself up to stand. As we sat on the dock enjoying the cool breeze with the sailboat mast lights looking like low hanging stars, we talked about what an adventurer you are and how great you have been so far on our trip. We are totally gobbling up your blog posts. Your food, meals and eating tips make my mouth water. Last night we shared a big family meal with Cathy, Craig and Tyler Ferry. We all gave thanks for our blessings of bounty and friendships fostered through family and even over the many miles. This morning we said our farewells to the Ferrys but they promise to be out again next year. Such blessings. Your idea to bring along the jolly jumper was brilliant! It means a lot that you are following along with enjoyment. You both are an inspiration to us as well so we love to hear that we are paying it forward. Off to do some more writing! 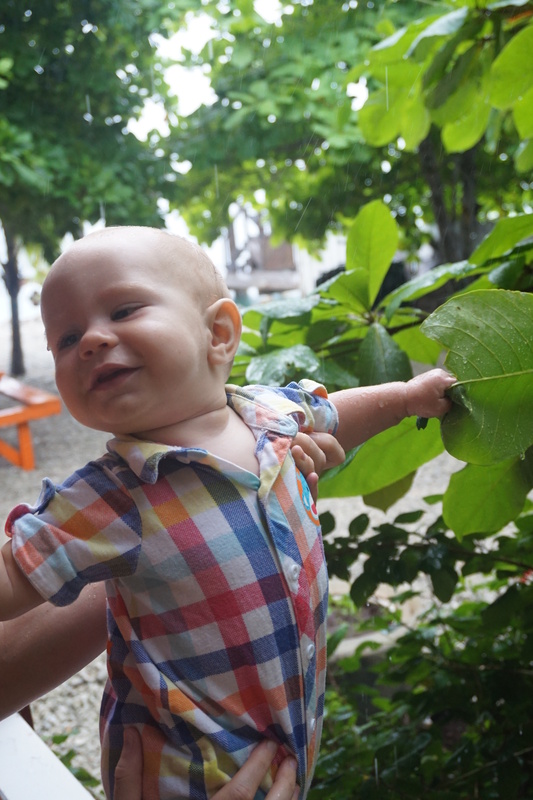 Asher – you are a very fortunate baby. Jim and Alyssa – you are inspiring parents, and your blog posts are truly amazing. As Goethe once said… “The condition of freedom is risk”, and you three are embracing freedom in many wonderful ways. Keep it up, and thank you! Very well said John. Taking smart risks is a very big theme of our experience. We will do a post on this in the future. So glad you are following along. Mikey wants to say he likes the Rio Coco Cafe and that he hopes one day to change the stat from 100 to 101 top CEOs making him the top profit earner but would help the poor people in the different countries. Tessa says she hopes your having fun and she hopes to see you all real soon. Tessa would of loved singing and performing for everyone at the cafe. She couldn’t believe that they hand out free drink for the performers. She said she would go everyday. Hearing about Asher growing reminds us of our kids at that age and can’t believe how much they have grown. Time flies. Mikey, it is great that you want to give to people in need. We are very blessed with everything we have and it is important to give back. If you don’t have money, you can give your time be volunteering. You would love the smoothies! Tessa, I could see you performing. They had a great sound system so it was very professional. You would also love the smoothies or the icy lemonade smoothie! Some kids have tables here selling things, you could also do that. Something they need to sell here are chocolate covered frozen bananas. We have found them in other places but not on this island. Time sure does fly which is why I’m so glad to spend this quality time with Alyssa and Asher. We will spend QT at Muriel when we get back. Rachel said “Hey, I am surprised to see Asher with shorts on.” She said that at camp it was diapers and swim shirt most days and of course a cute sun hat. It is great to see him developing in pictures. Some poses I see so much of Alyssa, and others I see Jim big time. 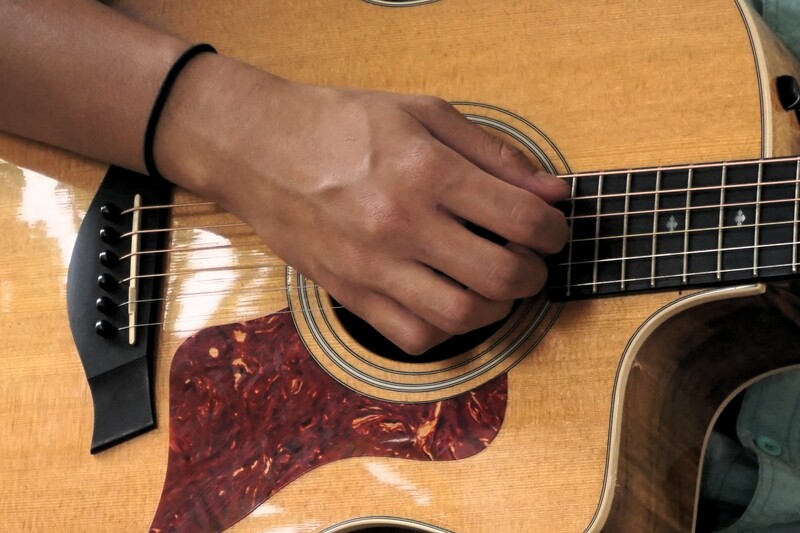 In this episode of the Amazing Non-Race, I marvel of what a gift your musical talents are. 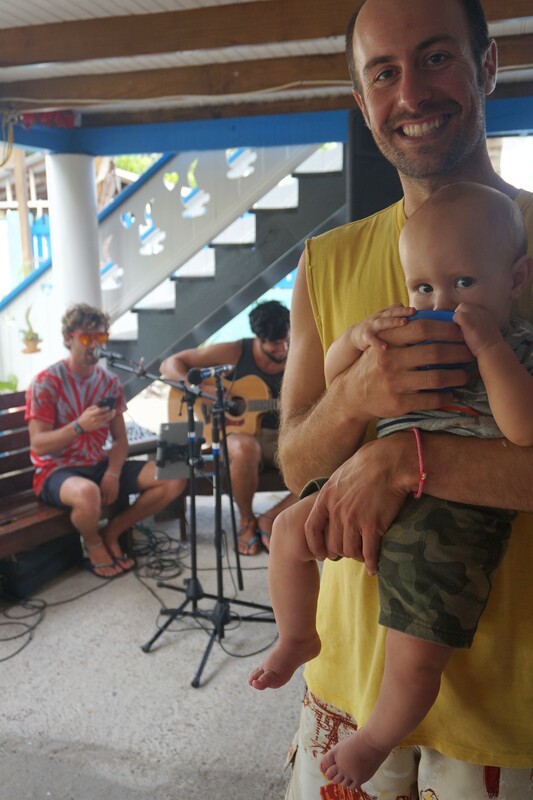 Music knows no political or geographic boundaries and clearly is an awesome way to meet people and make friends. Keep singing and take care. Dear Sweet Asher you look so much bigger every time I see you. I cannot wait to hear your saying, “mamama, bababa and yayaya!” I noticed your hair is getting longer and it is the same colour as your Moms. Asher, your daddy loved his jolly jumper and it made us smile to see his smile and bouncing joy! Dear J&A – The idea of the Rio Coco Cafe is really something. We are so lucky that surrounding us are ordinary people doing extraordinary things to help one another. I want to read up on the Miskito people so thanks for the history info. Your music together is truly inspiring and I would love to read the lyrics of a song you have written on Utila. Thanks for the Skype call home, it means everything! Hugs to everyone.